Kate Middleton's wedding dress is an ivory gown with lace applique floral detail designed by Sarah Burton at Alexander McQueen. Made of ivory and white satin gazar, the skirt resembles "an opening flower" with white satin gazar arches and pleats. The dress has a beautiful train that measures just two metres which is modest in comparison to many previous royal brides. The train and bodice are decorated with delicate lace flowers, handcrafted using the Carrickmacross lace-making technique, which originated in Ireland in the 1820s. Kate worked closely with Sarah Burton, it was widely speculated that the design house of Alexander McQueen had won the job to create the Royal bridal gown but the Palace was keeping tight lipped throughout the run up to the big day and would not confirm either way. Today St James's Palace said the bride chose British brand Alexander McQueen for the "beauty of its craftsmanship" and its "respect for traditional workmanship and the technical construction of clothing". There's no doubt that together Kate and Sarah Burton have created a remarkable dress for these times and there is no doubt that this style of dress will be seen in church wedding ceremonies across the UK if not the world. 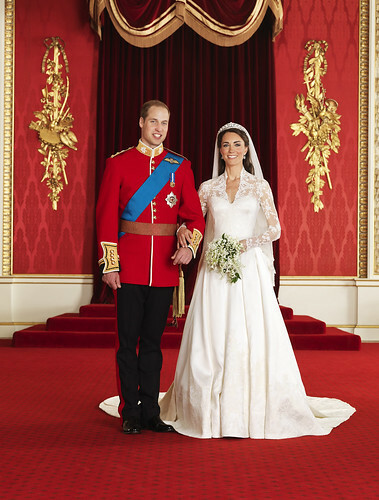 Miss Catherine Middleton’s Wedding Dress has been designed by Sarah Burton at Alexander McQueen. Miss Middleton chose British brand Alexander McQueen for the beauty of its craftsmanship and its respect for traditional workmanship and the technical construction of clothing. Miss Middleton wished for her dress to combine tradition and modernity with the artistic vision that characterises Alexander McQueen’s work. Miss Middleton worked closely with Sarah Burton in formulating the design of her dress. The dress epitomises timeless British craftsmanship by drawing together talented and skilled workmanship from across the United Kingdom. The dress design pays tribute to the Arts and Crafts tradition, which advocated truth to materials and traditional craftsmanship using simple forms and often Romantic styles of decoration. Ms Burton’s design draws on this heritage, additionally giving the cut and the intricate embellishment a distinctive, contemporary and feminine character. The Royal School of Needlework (RSN), based at Hampton Court Palace, assisted the Alexander McQueen team in accurately cutting out the delicate motifs from the lace fabrics and positioning the lace motifs with precision into the new design. The lace motifs were pinned, ‘framed up’ and applied with stab stitching every two to three millimetres around each lace motif. The workers washed their hands every thirty minutes to keep the lace and threads pristine, and the needles were renewed every three hours, to keep them sharp and clean. The RSN workers included existing staff, former staff, tutors, graduates and students, with the youngest aged 19. The RSN’s work was used primarily for the train and skirt of the Bride’s dress, the bodice and sleeves, the Bride’s shoes and the Bride’s veil. The Bride’s earrings, by Robinson Pelham, are diamond-set stylised oak leaves with a pear shaped diamond set drop and a pavé set diamond acorn suspended in the centre. Inspiration for the design comes from the Middleton family's new coat of arms, which includes acorns and oak leaves. The earrings were made to echo the tiara. The earrings were a personal gift to the Bride from her parents for her Wedding Day. Robinson Pelham have also designed and made a pair of diamond earrings for Miss Philippa Middleton. These earrings are more floral in nature to compliment the headpiece worn by Miss Philippa Middleton during the Service. A tourmaline and diamond pendant and matching earrings have been designed and made for Mrs. Carole Middleton. Two gold stick pins, one with a single gold acorn at the head and the other with an oak leaf, are also worn respectively by the Father of the Bride, Mr. Michael Middleton, and the Bride's brother, Mr. James Middleton. Miss Philippa Middleton’s dress was designed and created by Sarah Burton at Alexander McQueen. It is of a heavy, ivory satin-based crepe, with a cowl front and with the same button detail and lace trims as the Bride’s dress. The young Bridesmaids’ dresses were designed by childrenswear designer Nicki Macfarlane to echo the Bride’s dress. The four dresses were hand-made by Ms Macfarlane and her daughter Charlotte Macfarlane at their homes in Wiltshire and Kent. The Bridesmaids’ dresses have been created using the same fabrics as the Bride’s dress. The ballerina-length, full, box pleated skirt gives the dresses a sculptural quality, with the layering of ivory over white satin gazar adding depth of colour. They have all been hand-finished with delicate English Cluny lace, which is visible under the skirts, and four layers of net underskirt. The puff sleeves and neckline are trimmed with the same English lace as the Bride’s underskirt. The backs have been finished with the same button detail. The sashes are made of pale gold, wild silk, which is tucked at the front and tied at the back in a sumptuous bow. As a special memento, the Bridesmaid’s name and the date of the wedding have been hand-embroidered onto the lining of each dress. The waist-length capes, also created by Nicki Macfarlane, are made from ivory Yorkshire wool, edged in fine English lace and tied at the front in the same satin gazar as the dresses. The Bridesmaids’ shoes were designed and made by Devon-based Rainbow Club. The classic Mary Jane style shoes are made from satin and finished with a Swarovski crystal buckle. Devon-based Rainbow Club have been designing, making and colouring handmade wedding shoes since the mid-1980s. The Bridesmaids’ flowers were designed and made by Shane Connolly. The ivy and lily-of-the-valley hair wreaths worn by the younger Bridesmaids were influenced by the Bride’s mother’s own headdress at her wedding in 1981. The bouquets held by the Bridesmaids replicate the flowers used in the Bride’s bouquet, and they incorporate lily-of-the-valley, sweet William and hyacinth. The Pages are wearing a uniform in the style of that worn by a Foot Guards officer at the time of the Regency (the 1820s). The uniform draws its insignia from the Irish Guards, whose Colonel is Prince William. The Pages will wear a gold and crimson sash (with tassel) around their waists. The sash is worn by officers in the Irish Guards when in the presence of a Member of the Royal Family. The uniforms were designed in the Royal Household and were created by Kashket and Partners, who have also fitted Prince William’s uniform for his Wedding Day. The collars and cuffs were created by the Royal School of Needlework.